Date of 2006 London-Brighton Commercial Run ? : On May 7th. Photos received from Emmanuel Abit, (France) who has a very unusual car. 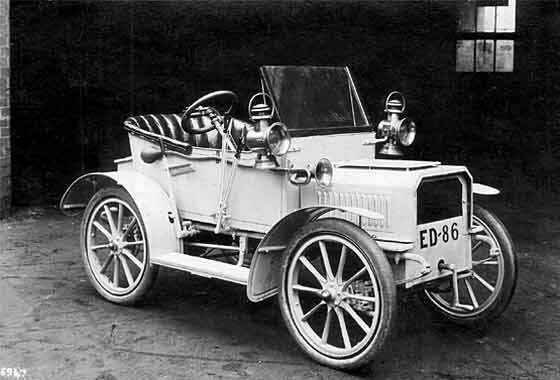 It is a cca 1901 Begot et Cail, serial number 135 with a De Dion Bouton engine 4442. He asked if we could get more information on this actual car and the make. 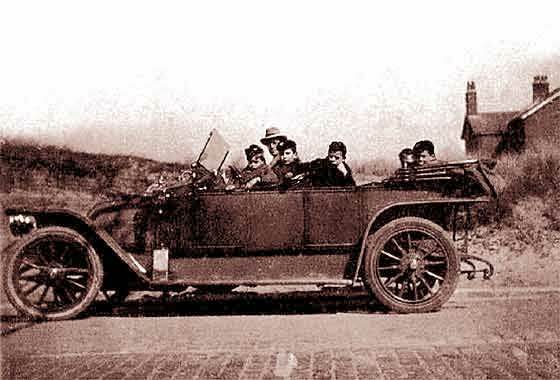 The car was made by Begot et Mazurie, Reims, France who were general engineers making voiturettes. In 1901 two light cars appeared under the name Begot et Cail. One had a 5hp single cylinder De Dion engine, and the other a 7hp V-twin of their own make. 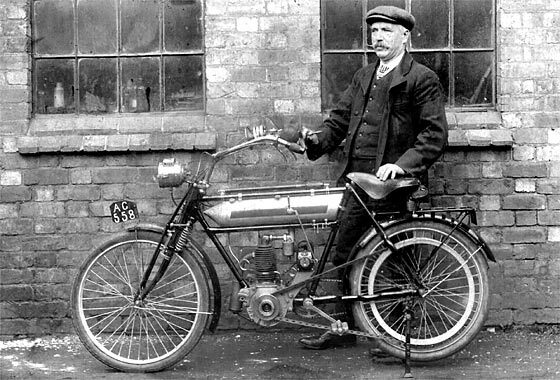 This is one of three photos received from David Shearer (UK) about his Great Grandfather Thomas Smith (1856 - 1950) from Kidderminster, an engineer, cycle and motorcycle maker. This is a cca 1904 Humberette having a single spoke steering wheel. Registration ED started in Dec. 1903, so is one of the earliest registered, probably in 1904/5. Photo is later because the unusual body and the updated doors and windscreen. One of a number of photos received from David Shearer (UK) researching his Great Grandfather Thomas Smith. On this one we had the assistance from the veteran motorcycle expert Geoff Morris who traced the registration to an Ernest Cecil Hallam of Atherstone. The date of registration was March 1905 and make was given as 2 3/4 HP. As no makers name is mentioned, this apparently suggests that the motorcycle was a one-off or a prototype. Four further owners to 1914. Nice photo received from Paul Duffy (UK) who has been researching his family tree and discovered the picture. His family folklore suggests this vehicle was the first in Penrith. A manufacturer would be good, info on the Reg. plate would be fantastic! Our Belsize owner Tim Harding recognised the car as a Belsize V564 with the distinctive radiator which they had for just a few years. Registration, assuming it is U 564, (no other letter before) is from Leeds and from mid to late 1906, not 1905. 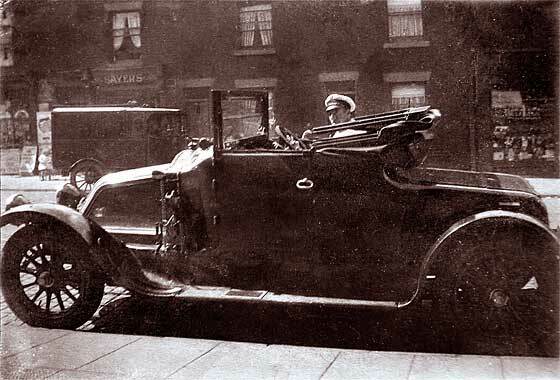 Photo of an unusual car received from Peter Strutt (UK) being driven by his great-grandfather, William Taylor, the coachman to the Duke of Portland's agent, who ran the Welbeck Estate office in Mansfield Woodhouse, Notts. We are pretty sure that this is a cca 1906 Globe as manufactured by Hitchon Gear & Automobile Co, Accrington, Lancashire (1904/7). Only about 12 such cars made. Not connected with the Globe mentioned earlier on this Help Page, or the US Globe car. 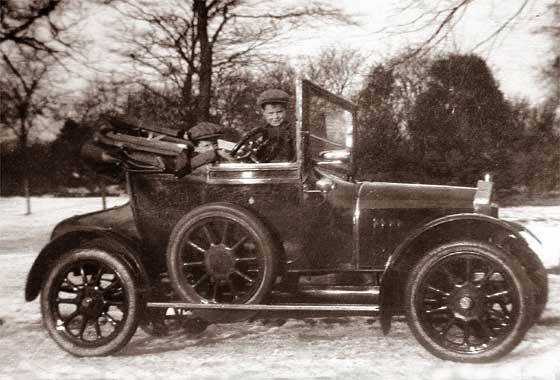 One of a number of photos received from Robin Rigby (UK) showing a series of cars owned by his Grandfather Dr Francis Rigby, a doctor in Preston, Lancashire. 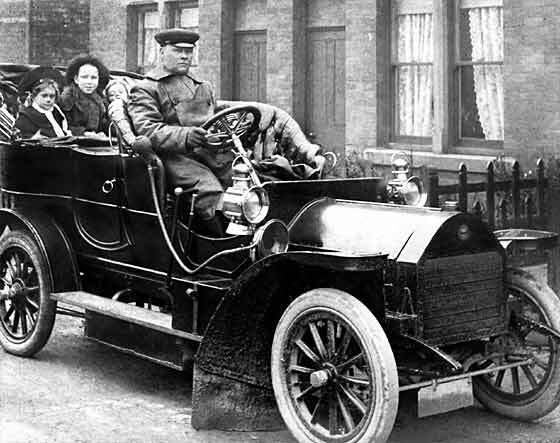 This one is of 1912 Humber 11 HP with a number-plate indicating Preston in mid 1912. Grandfather appears to have been quite an important man also being responsible for the local workhouse and isolation hospital. He qualified as MB ChB in 1901 and first went to sea doctoring on RMS Plassey, doing the 'slow boat to China' and back. 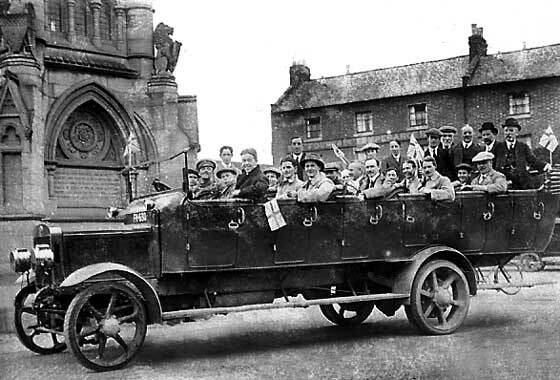 Photo of a charabanc outing received from Diana Hunt (UK) which she found amongst her mother's belongings. Photo, possibly taken in Startford-u-A, was titled 'Hereford Run' but no other information. Our Tim Harding identified it as a cca 1913/14 Bristol C50 Charabanc made by the Bristol Tramways & Carriage Company. During WW1 they made fighter planes for the related Bristol Aeroplane Company. Registration could be FH, so the bus would have been registered by Gloucester CBC. Photo of a book received from Dominic Pinto from London who is helping a colleague in the (USA). His friend has a book whose front cover has a picture of a car apparently not mentioned elsewhere in the book. The photo is of a 1914 Opel 90 HP Grand Prix car. The car appears to have survived and on this photo is wearing some some modern wings, seemingly knock-on wheels and modern wider tyres. The numberplate suggests the car was registered in the Republic of Ireland. Photo received from Dan Richards (UK) found while helping to clear a late neigbour's loft. Interested in identifying the car. This is a cca 1915 Saxon Model 14 manufactured by the Saxon Motor Co of Detroit Michigan. 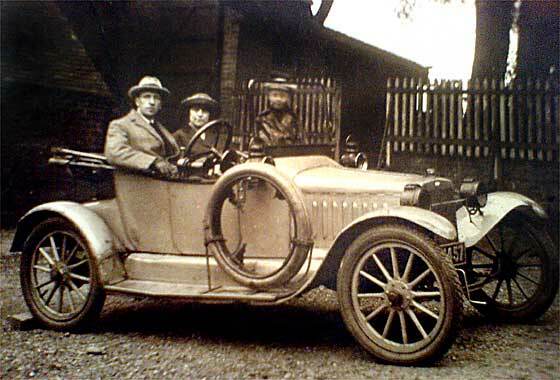 The condition of the car appears 'well used' so it is possible that the picture may have been taken during the twenties. Number plate is covered so cannot date registration. Saxons became the tenth largest producer of cars in the US. This is a right hand drive UK model. 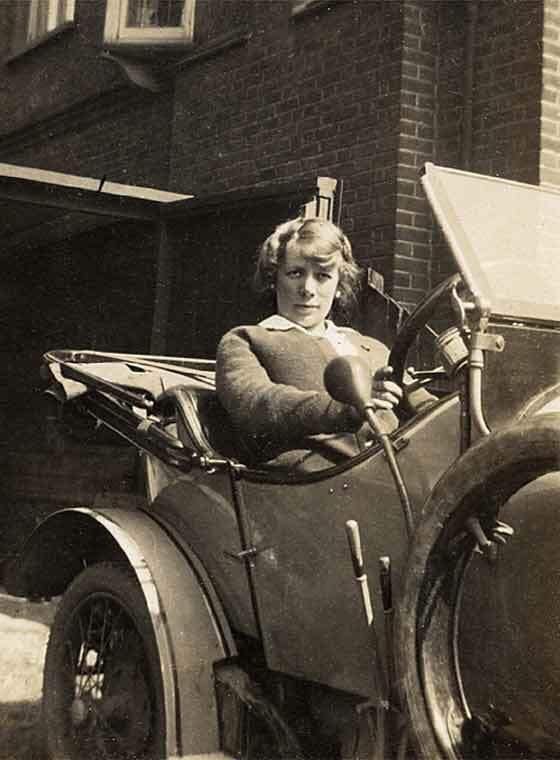 Unusual photo received from Avril Pedley from Leeds (UK) of her grandmother sitting in a what appears to be a cyclecar. Further investigation suggests this is a cca 1915 Globe Cyclecar. These were designed by EH Forster, made by in France by F. Terrier et Cie (Sphinx-Globe), and in England by sanitary engineers, Tuke & Bell Ltd. Anzani or Aster single-cylinder engines or J.A.P. 2-cylinder engines were used, and the cars had belt or chain drive. Later briefly built as 'Forster' cars. 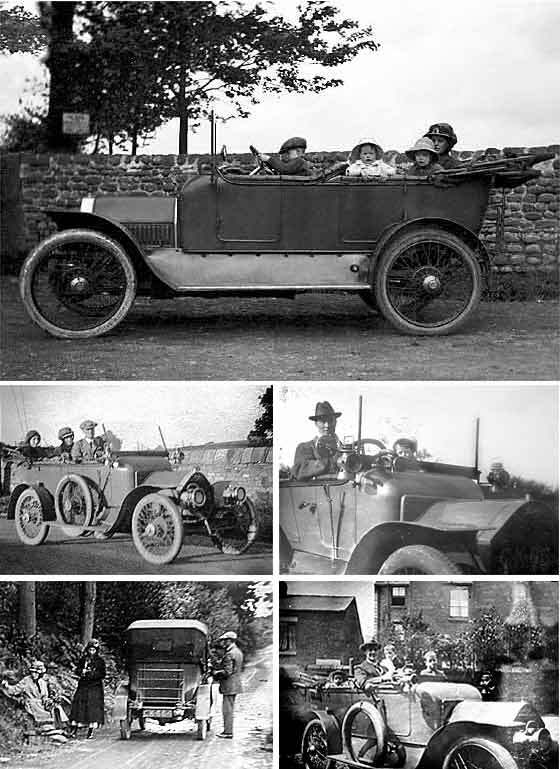 Further photos from Robin Rigby (UK) showing a series of cars owned by his Grandfather in the period 1915 to 1933, when he died. The car shown right is a cca 1914 Swift. which was the first car. 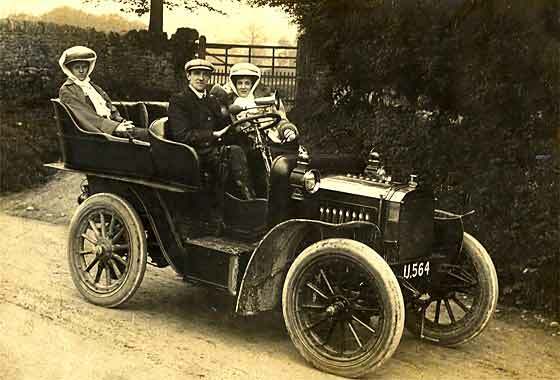 The second seems to be the Humber (below), followed by a cca 1915 Renault, probably a 20HP Sports two seater, which in the photo is being driven by their Chauffeur (sports?). Somewhere into the picture also comes a cca 1914 Renault Tourer. Finally, there was a lovely cca 1929 AC Six. Photo received from Anne Duncan (UK) of her maternal grandmother listed as a chauffeuse on her marriage certificate. The photo may have been taken in Edinburgh. 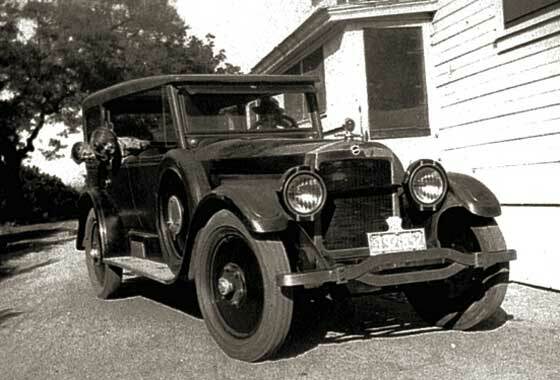 The car in the photo is a cca 1917 Dodge Tourer, identified by not having a bar between the headlamps and not having a bumper. Regretfully the numberplate is hidden so this cannot give us either place or date of registration. The crest on the rear door, and the emblem on the radiator cap are not decipherable. AA badge ? 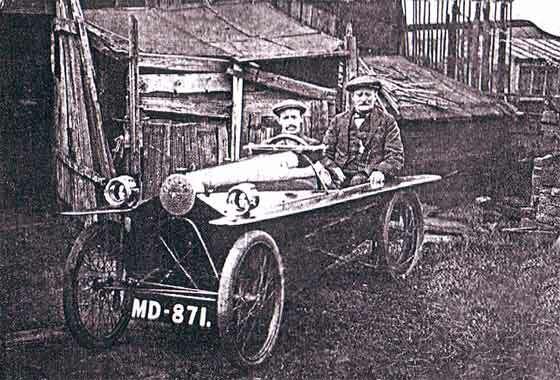 Interesting photo received from Chris Twigg (UK) showing great-great-grandfather Theophilus Twigg and great-grandfather Samuel Twigg sitting in what could have been the very first car in Wombwell, a small town near Barnsley. The vehicle is a 1920 Tamplin Cyclecar made in Staines and carries a Middlesex registration. 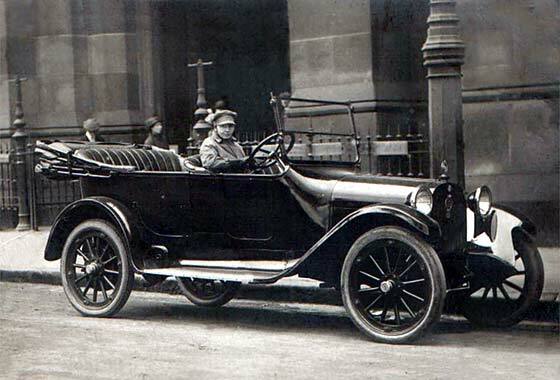 Tamplins were made from 1919 to 1927 and were a very successful UK cyclecar makers with 1,250 produced. 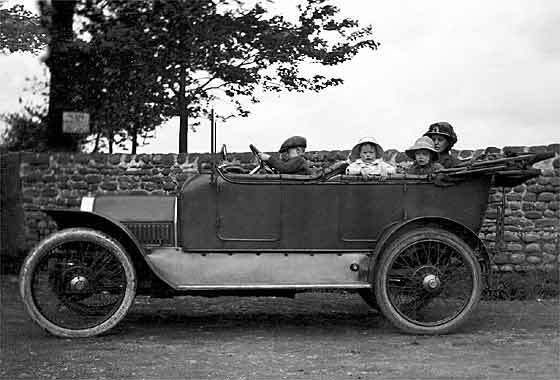 Early cars had tandem seating and JAP or Blackburn engine. 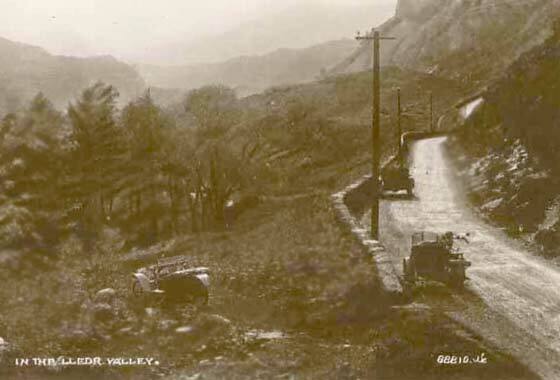 Old Postcard of the Lledr Valley in the northwest corner of Wales received from David Hastings (UK) showing a three wheeler car off the road on the left. He had just found the card and wandered what was the make of the car, which model and when was it built. We can advise that it is a cca 1923 Morgan GP or perhaps 'Sporting'. Little difficult to say due low resolution. 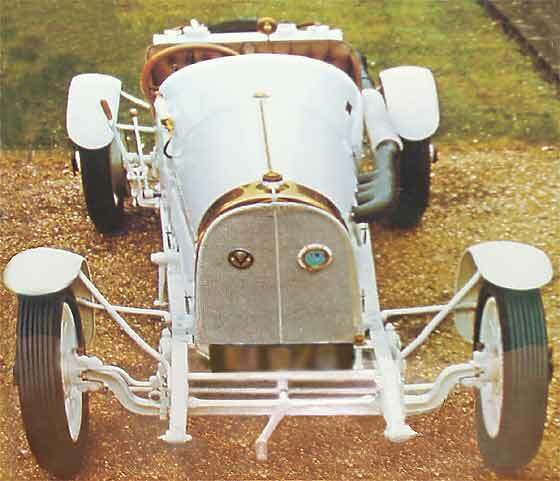 The Grand Prix Morgan was built between 1913 and 1926 following their win at the Cyclecar Grand Prix in Amiens. Photo received from Steve Canham (Hawaii) of his father and aunt, now 90, in a car in Southern California. Aunt said family had Packards. This is not one and took absolute ages to identify. Many American cars had multi section complex front bumpers, seemingly a proprietary item with exactly the same small logo plates on each side. This helps to confuse. 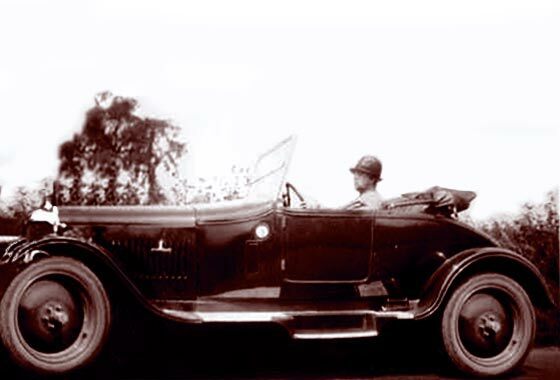 Contenders included the Wills Sainte Claire, but the car on the photo is a cca 1923/4 Studebaker Big Six Tourer, fitted with a ' winter hardtop '. 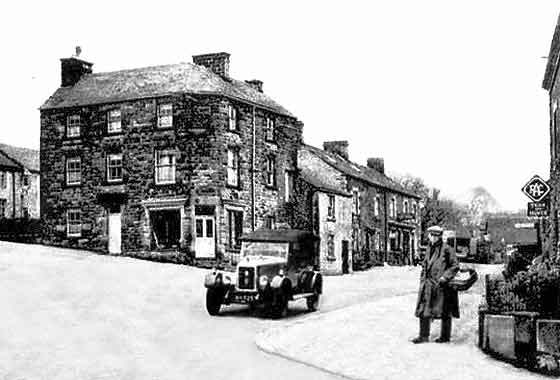 Photo received from Roy Keeling (UK) of a car photographed in The Market Square in the village of Longnor in Staffordshire. 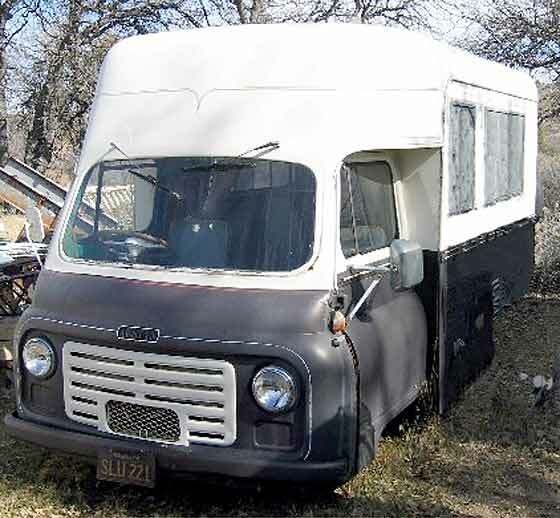 Wanted to know make and year, and whether it is a car or van. It is an Armstrong Siddeley 14/4 Mk2 'Cotswold' Tourer registered in Wiltshire in approx April 1925. This of course does not date the photo. The man in the photo with the basket may have nothing to do with the car. The 14/4 was a relatively upmarket vehicle unlikely to have been used for 'deliveries'. Three fascinating photos received from Ken McLeod (UK) found in an album at a local antique fair depicting a family’s adventures in Australia. The album appears put together by a couple named Will and Em sent in 1930 to Dolly and Bess who visited them. The album has twelve photographs with short stories and shows clearly how Australia looked back in the late 1920s. Our Singer man Simon Bishop thinks it is a cca 1929 Singer Senior two Seater. Photos suggest February 1927. 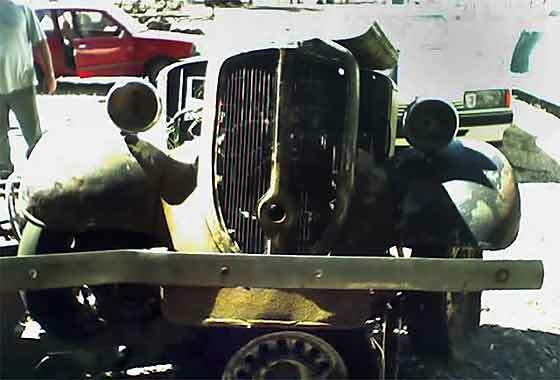 Looks like a 'phone photo' received from Aron Page (Australia) advising he has Jowett basket case and needs model and year. Only details he has is that it is Model CB, Chassis No D8 CB 14378, Body No D8CB 979 5AE. To us non-Jowett experts, it looks like the front of a Bradford van. We contacted the pressofficerlibrarian@jowett.org who confirmed it is a Jowett and that the contact has been passed to their branch in Australia. He is visiting Australia soon so hopes to call in and confirm. Our member Michel Gosset found amongst his father’s things a roll of early 1940’s exposed but undeveloped film which was taken on 26th of August in 1944, the day that Paris was liberated. 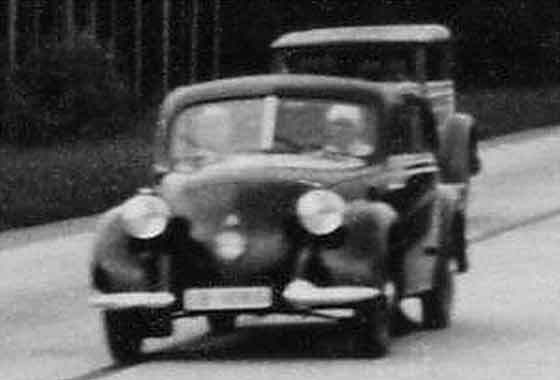 One of the photos showed an early De Dion Bouton and a Simca and in the foreground a part of a cycle-car type of machine, which intrigued. Investigations revealed that it was a cca 1939 Mochet Velocar, a real 'cyclecar' which required hard human pedaling to achieve motion. See sub-page for info. This is one of a number of photos received from Peter Daws (UK) which we are currently investigating. This photo was taken on a family holiday in mid 1930s in what appears to be Germany. Photo is from a series of German cars swinging out from being photographed from the central reservation (!) This photo took some investigation because it looked like an early Volkswagen. Interesting in the evolution of the 'peoples car'. It is in fact a cca 1935 Mercedes 170H, rear engined, water cooled. 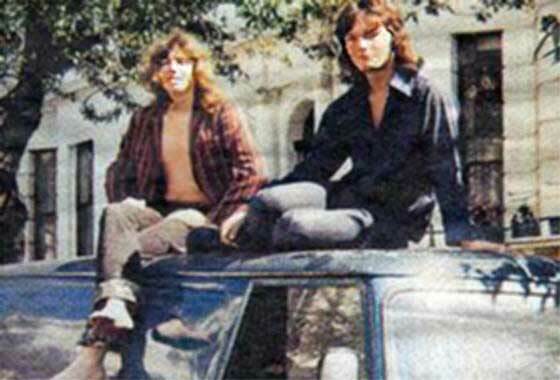 We were contacted by a TV Production Company who were going to make a programme about Prime Minister Tony Blair's pre-university period when he was heavily into trying to become a rock promoter-star. During this period he purchased a Thames van to move the group Jaded round gigs. TV people were trying to find if the van was still around so they could use it in the programme. Regretfully we could not help and eventually a similar white van was used in the programme on Channel 4. Photo received from Martin Gunnarsson from London (UK) asking for an approximate valuation and information on how to register it in the UK. It had been dry stored in France for the past 40 years. He noted that 1929 is stamped on crankcase but our motorcycle expert Geoff Morris suggests earliest it being is a cca 1949 Monet & Goyon. Being a utility machine, the value is approx £600-900. He will need accurate dating and to contact local Vehicle Registration Authority to get it registered. Request from our Jowett expert Alan Benewith for any information on the Humfrey-Sandberg freewheel that was in use around 1928-1930. Any info, especially tachnical data, would be welcome. Please email us.